• Cat Beds & Sleep Supplies On SaleCat beds & sleeping needs, on sale! • Cat Feeding Supplies On SaleCat food and feeding supplies, on sale! • Cat Grooming Supplies On SaleFrom cat brushes & combs to cat shampoos and claw care products, all on sale! • Cat Health Products On SaleSupplements, treatments & remedies to keep your cats healthy, on sale! • Cat Holiday Products On SaleHoliday-themed items for your cat, on sale! • Cat Litter & Supplies On SaleSupplies for your cat's potty, on sale! • Cat Play Products On SaleCat toys, furniture, & other play items, on sale! • Cat Show Supplies On SaleSupplies for Cat showing and breeding of purebred cats, on sale! • Cat Training Supplies On SaleTraining aids for cats, on sale! • Cat Travel Supplies On SaleCat Travel & Transport Supplies, On Sale! • Cat Wear On SaleCat collars, harnesses, tags, charms, and outfits on sale! • Kitten Supplies On SaleSupplies for taking care of kittens, on sale! • Senior Cat Supplies On SaleProducts to make life easier for your senior and geriatric cats, on sale! "Nap Time!" cat sleep shop! Cat food and feeding supplies, on sale! of cat food & feeding supplies! of cat palliative care & grief support products. Products for grooming your cat, on sale! Bulk Plastic Flea CombsIncludes a total of 100 combs! Bulk Rubber Coated Grooming BrushesA dozen rubber-coated brushes that can be used for either wet or dry grooming! cat health supplements & remedies! cat litter boxes & litter supplies! cat play supplies & accessories! Cat travel & transporting necessities & accessories, on sale! Foldable Travel BowlA handy option for travel or cat shows! Hemp Boutique Cat CarrierGreat for a quick vet trip! K9 Optix® Protective EyewearYes, sunglasses for your cat. Shut up! Pet Bumper ProtectorsPads the inside of kitty's hard-sided crate for safety! cat travel & transporting needs! Clothes for your cat, on sale! Biker Black Harness DressGot a tough girl kitty? Here’s her dress! Black Biker Harness VestKitty will be wanting to get ink next! Blue Denim Harness VestMake a statement in fashion and comfort! Crystal Collar CharmsSix lovely designs! cat outfits, collars, harnesses, etc. Products to help your cats enjoy the holidays, on sale! Love Bug Combo ScratcherA big scratcher for your Love Kitty! Reindeer Dual Cat ScratcherYour cat knows that Christmas is a special time; help her celebrate with this! Small Round Pumpkin Combo Cat ScratcherTwo scratchers in one, for smaller cats! Supplies & accessories to make life easier for your senior cats, on sale! 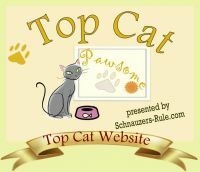 of products for senior and geriatric cats!